Who knew that trimming an artichoke can be such a form of art?! The burly man in front of me would pick a leafy artichoke out of a deep wooden crate, turn it fast into his left hand and, with a sharp knife in his right, efficiently trim off the leafage. It was like a second nature to him, a movement so practiced through the days and years that it had been perfected to a smooth knife-against-artichoke dance. The leaves, dispensed with, would fly off straight into another crate at the man’s feet and he would toss the freshly trimmed, soft and tasty heart in a large bucket filled to the brim with water and dozens of other artichoke hearts. All through his skillful performance the man hardly ever broke eye contact with his two friends. The three of them were discussing something seemingly of utter importance to them in a fast and sharp Venetian dialect. It was a beautiful scene. So genuine, unadulterated, pure travel documentary gold. If you had seen it in a travel programme on TV or online, it would have filled you up with a strong urge to get out there, to experience things in the most authentic way, to meet this world of ours face to face. To my left, the Rialto fruit, veg and fish markets stood on the same place where they first started being held over ten centuries ago. Right in front of me (and behind the artichoke trimmer and his two friends) the blue waters of the Grand Canal sparkled in the early lunchtime bright sun. I was rooted to my spot, unashamedly staring at the three old friends and just taking it all in. A beautiful, unforgettable memory was in the process of being shaped in my head. 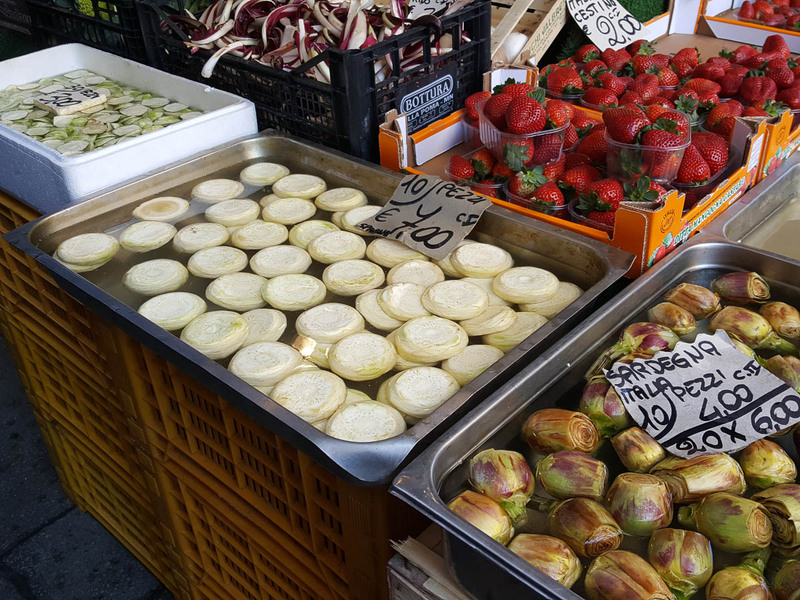 But it didn’t say anything about capturing the living and breathing Rome – its markets, its streets, its people and their daily struggles and victories. It was all about the city’s immutable history rather than about its present as shaped by its past while looking straight ahead. Soulless, uninspired and self-serving even, I thought to myself. After visiting ten museums in a row, what do you remember most? The rooms with endless artifacts and paintings which you and hundreds of other tourists jostled to see up close? Or a sudden scene of life the way the locals live it? Or even, perhaps an unexpected human interaction which made your day? You know me! I am all for museums, for discovering the past of a city and a country trough its orderly arranged heritage in large airy rooms with detailed explanatory signs. 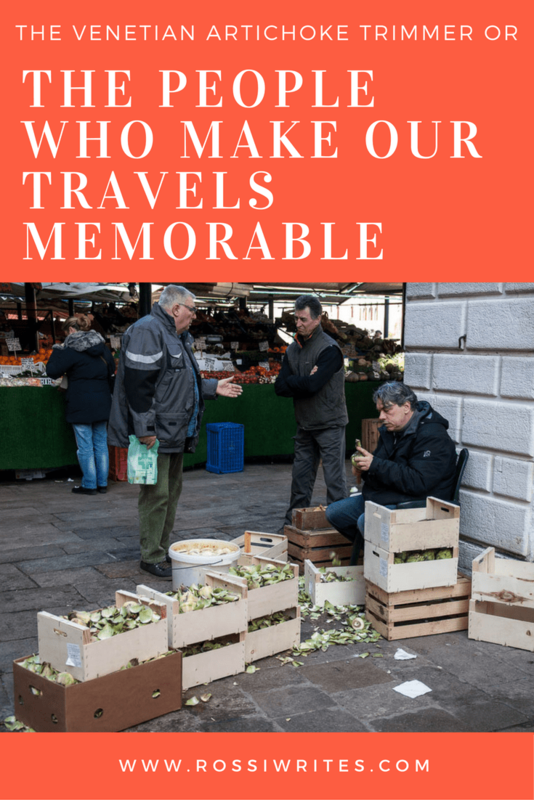 Yet, looking back, my most evergreen, most cherished travel memories seem to always be linked to some weird and wonderful encounters of the human kind. Like the waiter we had in a small restaurant in Nice, who was the most colourful French person I ever met. He was minuscule and flirty in a very French way, yet he remained cool as a cucumber when a group of strange men appeared at the door and tried to gain entrance into the restaurant to (as we found out later) racketeer the owners. Sitting around our little table, eating our pizzas with seafood (yes, it tasted great!) we observed this scene of real life develop in front of our eyes, the high tension skillfully diffused by our French waiter. I still remember a smiling sales assistant at the Edinburgh Wollen Mill, who (upon finding out that I was Bulgarian) started telling me with glee about a holiday he had spent as a child with his parents in Nessebar on the Black Sea. ‘My mum would give me 10 levs pocket money in the morning and I was rich!’, he reminisced sweetly about the dozens of lollipops and chocolates he used to treat himself to. At the time 10 Bulgarian levs were about 3 British pounds, yet you could buy so much more at Bulgarian prices. It is lovely to make connections (even fleeting ones), to observe the local people as they go about their day, to see the place we have traveled to as it is rather than as a perfectly polished, expertly photoshopped visual dream. And, you know what, it is a shame that when we travel, we seem now to be conditioned to want to reproduce that perfect imagery which countless marketing campaigns have instilled in us as something to aspire to. Hence we get upset and even angry when a popular sight we are at is overrun with other tourists which get in our shots. Hence we keep posting on social media frankly banal pictures of endless cups of coffee from everywhere we go. Hence, we want to capture yet another blazing sunset, yet another stunning landscape, yet another perfect curving street. Ideally, without any people in them. I am starting to think that by doing this, we are missing on so much. It looks like we want our travel experience to be perfect, immaculate, freshly plucked from the pages of a luxury magazine. We focus on the things we see, rather than the people (known and unknown to us) we see them with. I have realised that lately I have started to become more and more interested in these people instead. 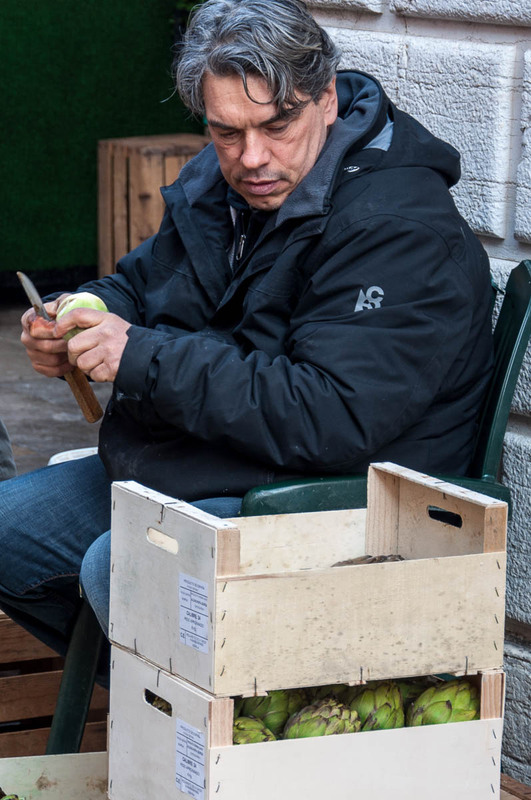 People who add flair to a place by simply being who they are, like the artichoke trimmer I came across at the Rialto markets in Venice. People who happen to be at the same place right when I happen to be there too, hence influencing with their presence (sometimes positively and sometimes negatively) my own experience. People who go on about their daily lives and thus give me a better understanding of the social fabric of the city or the country I am in. There are cities like London, for example, where as a tourist or as a short-term visitor it is incredibly easy to remain separated from actual daily life. Where you can pop in and out of museums and sights of general interest, where you can eat out and where you can shop without engaging significantly with a local all through your stay. I think I am starting to feel much more attracted to cities and places where I can engage with local people in a much more immediate and genuine way. Where I can take both mental and photographic snapshots of real life. Gosh, I even did a search today online for ‘reportage photography techniques’. We will see what’s going to happen and how (and if) my style of exploring and travelling is going to change. In the meantime, here it is to all the people I have come across my travels so far who have left me with a memory of them and who (unwittingly or not) have helped me see a place just as it is. What is your travel style? Do you like to immerse yourself in the local culture seeking to experience unique, albeit a bit rough around the edges moments or do you prefer to have it all picture-perfect and streamlined? No judgement, I just would like to know. Click here to see the artichoke trimmer in action. Of course, I did the touristy thing and took a short video of him, which I uploaded on my Facebook page, where it was quite popular. Have a look yourself! I so agree with this. The people I meet who share their life experiences with me are more memorable for me than just sightseeing.